Butternut squash and also refereed to butternut pumpkin in Australia and New Zealand, is a winter squash. It has a sweet, nutty taste similar to pumpkin. According to Specialty Produce the butternut squash was developed in Stow, Massachusetts in 1940 by Charles A. Leggette. The squash is a member of the gourd family and is the most widely grown winter squash. In the United States, Florida is the largest squash-producer with California ranking second. Butternut is rich in fiber, and low in calories. It also is a good source of minerals, including magnesium and potassium. 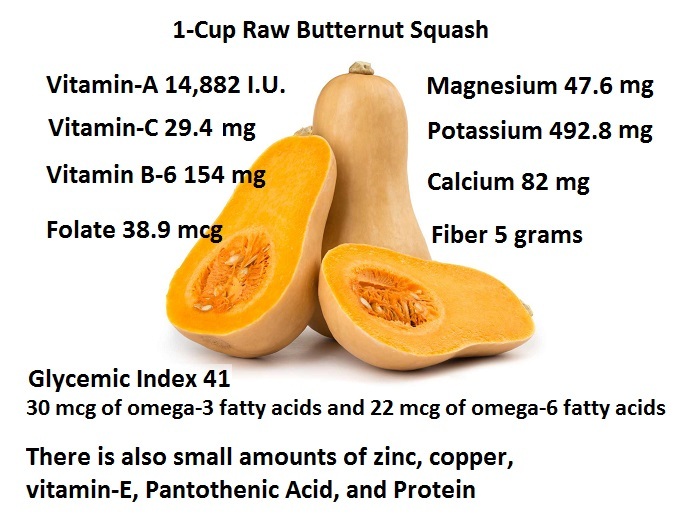 Those who have asthma or breathing problems, this squash can help, because of its magnesium, and vitamins A and C content. Medical studies since 1994 have reported that low magnesium intake is linked to asthma and chronic obstructive airways. Many studies also have noted that drugs used in the treatment of asthma causes loss of magnesium in the body (The Link Between An Asthma Attack and Magnesium). Dr. Carolyn Dean, MD, who authored the book, “The Magnesium Miracle,” states that magnesium has a calming effect on the muscles of the bronchial airways, as well as the whole body (Treating Asthma With Nutrition). 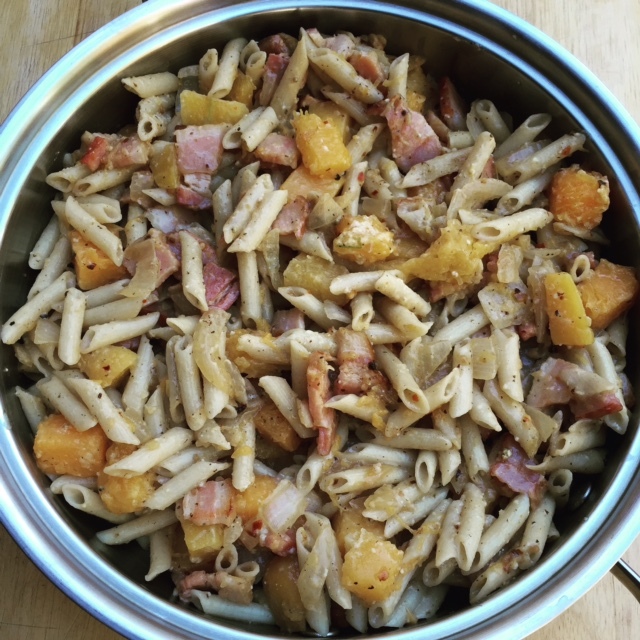 Let’s breath easier, and get that all over calming effect as we present our featured recipe: Gluten Free Penne with Smoked Bacon and Butternut Squash, and here is what you will need. Cook pasta according to package instruction. Save one cup of the pasta water before draining pasta. Set aside. 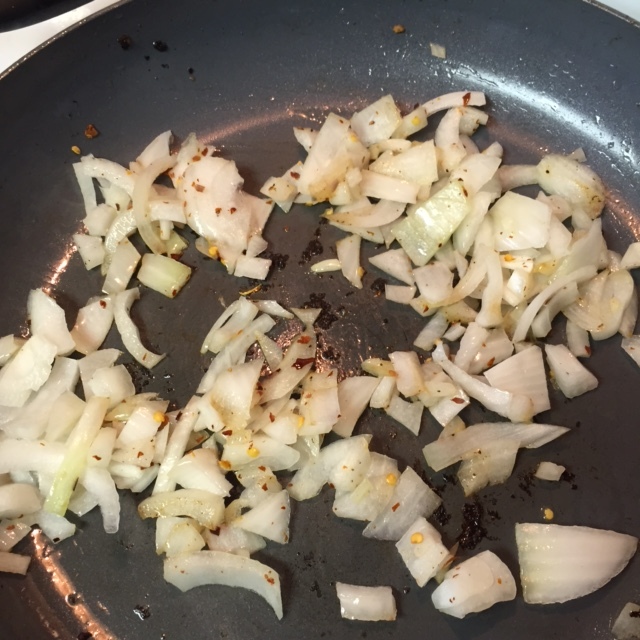 Over medium heat in a large ceramic coated frying pain, add oil and diced onion, red pepper flakes and crushed pepper corns, and saute until onion are slightly browned, about 6 to 7 minutes. Next add past, squash, and bacon. Mix until well incorporated. Next add cheese, and slowly add the reserved pasta water. The amount you add determines if you want the dish creamy or not. 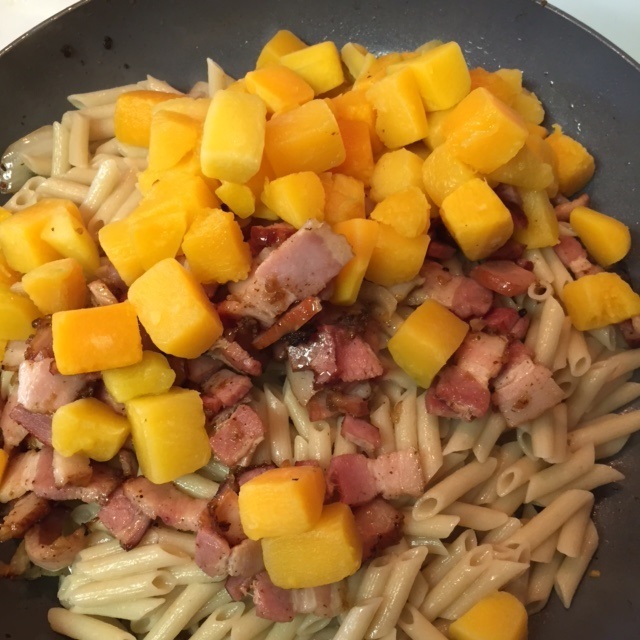 This entry was posted in Main Dish, Pasta, Pork and tagged Butternut squash, Butternut Squash Soup, Charles A. Leggette, French onion soup, gluten free pasta, Mediterranean Sea, Nutrition, Olive oil, Parmigiano-Reggiano, pumpkin, Roasting, Sheet pan, Soup, Tomato sauce, Winter squash. Bookmark the permalink. Squash and Pasta are a natural. This dish looks delicious. I love learning about healing your body through diet and nutrition. It helps alot that the recipes are delicious. Well – of course this would be delicious. It includes BACON!